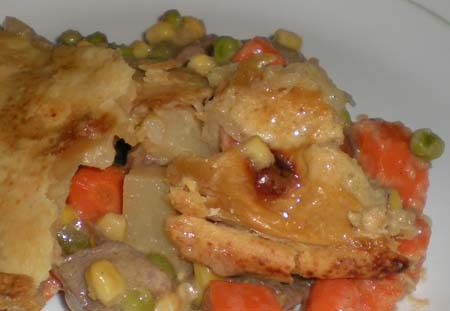 Definitely a top comfort food, this is my favorite way to use leftover chicken or roast beef. I am pretty easy going with the ingredients I use for the sauce. Depending on my mood, I may add a little bit of chopped garlic, some lemon pepper, or some paprika, which is always great with chicken. Think of this as the base and then expound on it. *I only use a crust on the top of the pie to cut back on calories. 1. Chop carrots and cover with water in a microwave safe bowl. Cook until barely tender, about 6 minutes. 2. Chop remaining veggies and add to a baking dish with the meat. 3. Mix soup, sour cream, herbs, add milk until mix is the consistency of cake batter and stir into vegetables. 4. Cover with pie crust and cut slits to vent steam. If desired, brush with egg or butter. 5. Bake at 375 (or the temp. recommended for pie) for 40 minutes or until crust is golden. Oh, yum. That looks delicious! Can’t wait to try it out. Mmmmmm! I know it was heaven when you made it for me!! VERY comforting. 🙂 missing u and ur cute little fam already!! Big yum to that. 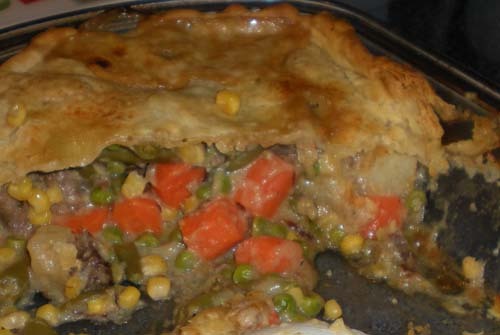 I loooooove pot pie!